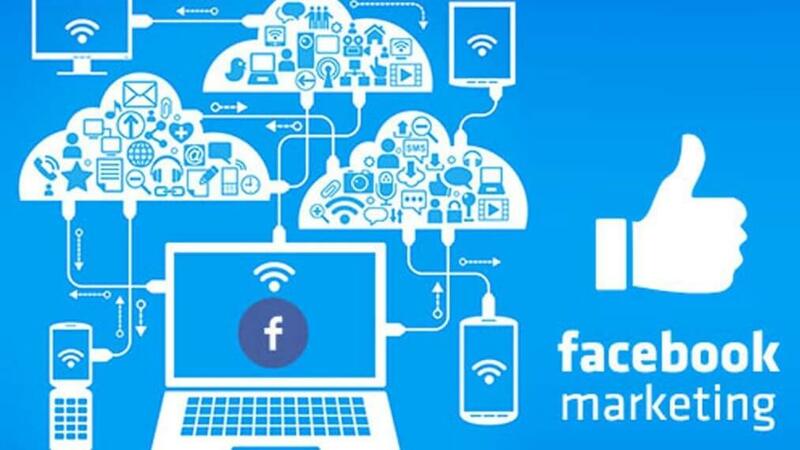 Facebook is one of the major social media websites now, and most of the small, mid-sized, and multi-national companies want their existence on Facebook. We often see social media icons on companies’ websites. 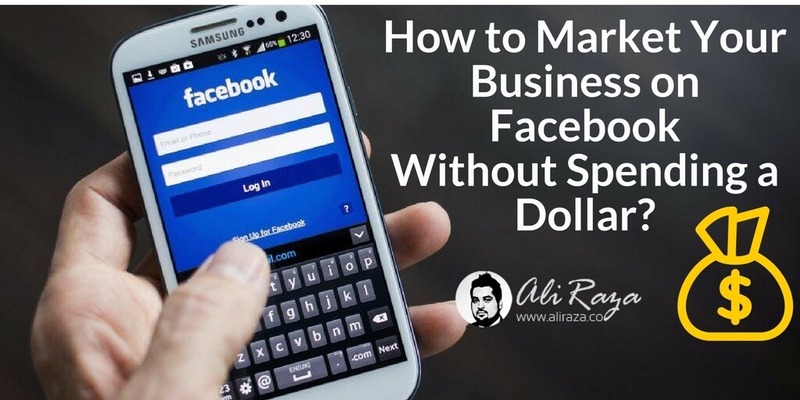 So if you’re seriously want to know how to market your business on Facebook, but you don’t have money to spend, or you don’t want to spend, then keep reading. So far we have established the situation that we do want to market our business on Facebook, but we don’t afford to spend money on, which means there would be tactics that might work as well as some tactics that won’t work. The most important thing in the process is testing. 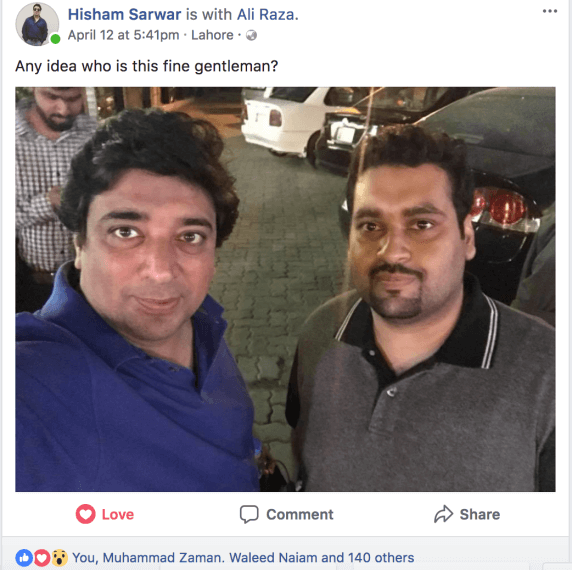 It may sound like an ordinary tip to market your business on Facebook, but there is a technical side of it: make sure that you’re connecting it with the relevant people. Keep an eye on the groups you’re a part of just to find and connect with new like-minded people. Don’t rush to add a dozen of people at once. Take it easy; the best way to do this is engaging with others’ content by leaving nice comments and liking their posts. 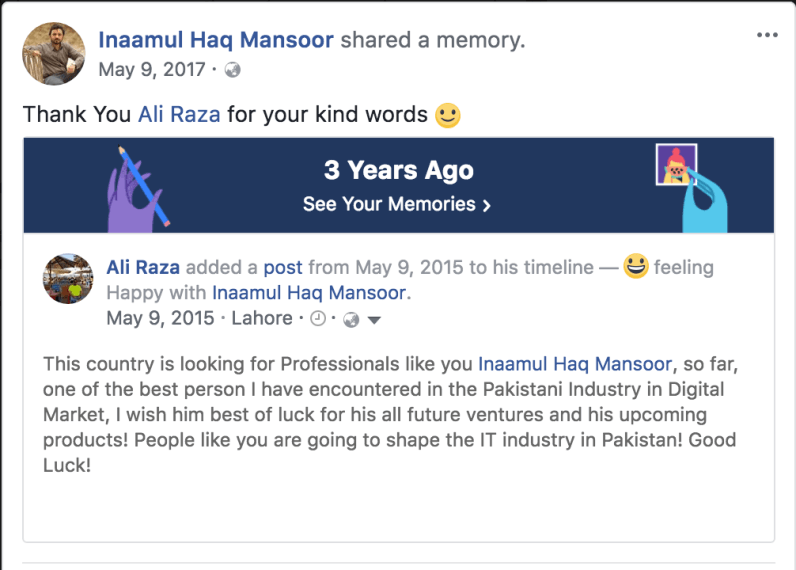 Here my colleague and an old time friend, Inaam Ul Haq praised me, I appreciate his gesture. The trick is that you won’t have to add up everyone because some of the like-minded people would add you when they’d find your comments interesting. So be sure that you’re giving value in the comments. 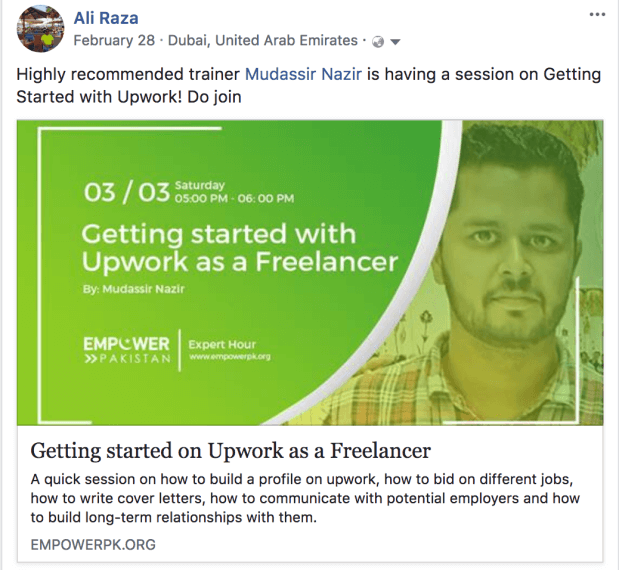 By the way, the engagement-strategy with the like-minded people isn’t limited to the groups, but instead, go on to apply on the Facebook pages as well as your profile too. 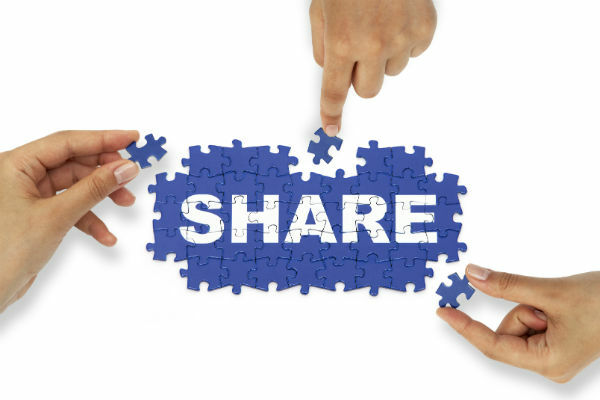 Sharing content is the key to get attention and start engagement. The number one reason people do this wrong is because that they only share their content. When you do this, you lose the chance to attract the people who are similar to you or share the same industry as yours. Plus, you also minimize the engagement with the friends and followers by not sharing others’ content. For instance, if you publish a new article once a week; sure you can share one article every day from your archives, but if you start sharing others’ content, you could share three times a day. Imagine where your Facebook engagement would go. 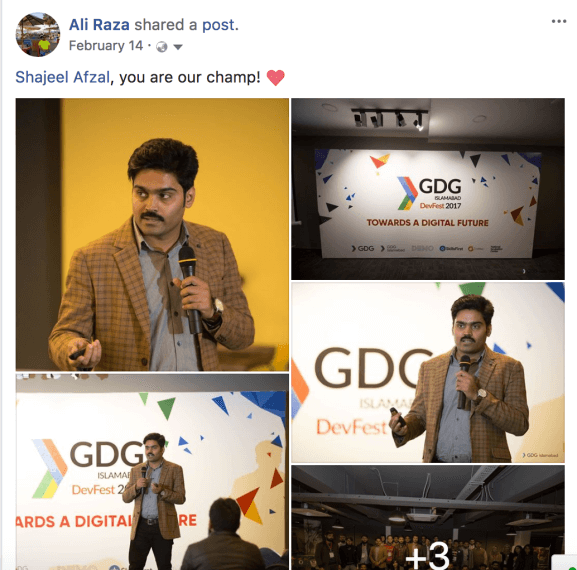 For example, Below are some of the screenshots of how i shared other people content, appreciated them and not only i gained ample of followers but serious people in my circle which helped in growing my business. One of the nicest and down to earth man, I have ever meet with, Shajeel Afzal! The best part is that you’d build up new relations with other marketers and bloggers when you’d share their content. Some of them might reciprocate the favor by sharing your content in the future. Facebook Group is one of the best strategies to market your business without spending a dollar if you do it the right way. Most of the people who use Facebook for marketing and use Facebook group, they take it as an advertisement hoarding, they stop by and paste their offer or announcement or blog post, and they leave it. What they should do instead is spend more time in the group and share ideas, give suggestions to the members, tell stories, reply to the questions, and occasionally share their content to keep the group running. If you want to make this thing right, then you better start off by creating a clear and concise Facebook group. Make sure that the group’s name doesn’t confuse people. Similarly, there should be rules to join and become a part of the group that everyone should follow. Lastly, the engagement matters a lot. If you don’t develop a plan of group discussion, there will be silence in the group, and therefore, people would either forget the group or they’d start leaving it. You can simply pick up a social media management tool that schedules your posts on Pages and Groups. It will help you start conversations even when you’re not at home or office. It does help us in engaging people when we’re away from the internet. Once you get back to social media, you can check up and follow up with the posts. 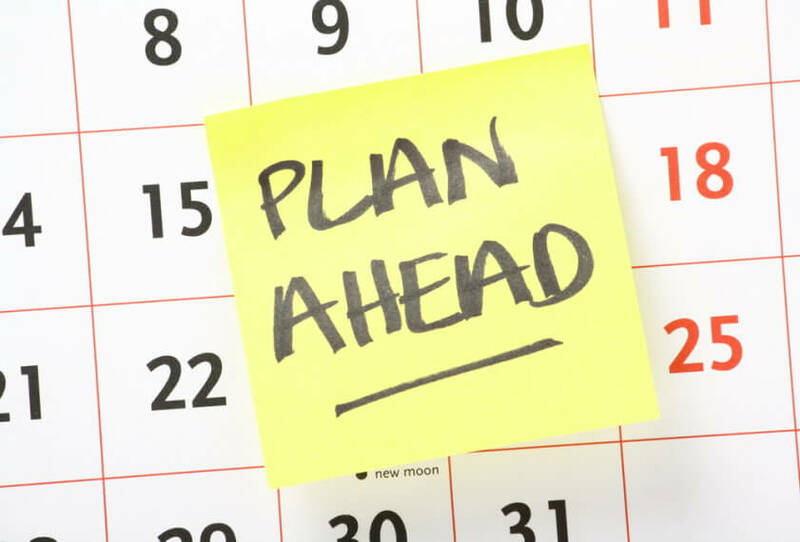 There are many social media scheduling tools like Buffer, Hootsuite, SproutSocial, and more which provide excellent post scheduling services. People are massively underestimating the power of Facebook covers and bio. It’s important to utilize the real estate to send the message across. Start with making an attractive Facebook cover for your profile, page, or group. You can design the covers using the tool like Canva. Moreover, you can write the business details along with your brand’s logo to let everybody understand what you sell. Similarly feel free to mention your email or phone or URL to let people easily contact you. Although this is not a perfect example to be discussed and there is a lot of improvement, but hey, it’s just an example. I also know, I’m missing my email & contact details, but you shouldn’t miss them in your own cover photo. You might have seen a lot of people just upload simple wallpaper-style banner images as Facebook covers. When we have this opportunity, why not to utilize it in the best way? Wishpond have discussed some great creative examples of facebook covers which worth a visit. If you haven’t started the Facebook live video, you’re doing a huge mistake. You don’t need a big studio to start the live video, or a camera gear to do. Just use your smartphone as you use it normally for other social media activities. One of the things that hold people back from starting live streaming is that they don’t speak English or they don’t feel confident about their English speaking skill; I’m here to tell you that just simply speak your native language or national language because most of your friends on Facebook would understand it. It’s true that Facebook is such a global phenomenon that we get to connect with people around the world, but won’t worry if you 13 of your friends are from the United States, probably 80 of your friends might be native to you, and they would understand you. 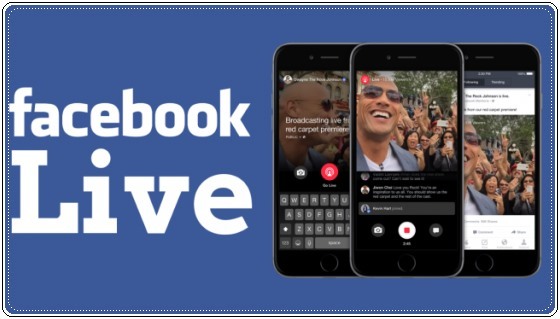 Neil Patel, posted an impressive guide on How to Use Facebook Live Video?, where he discussed various strategies and key techniques on live streams, interviews and coming up live on facebook and how it can be beneficial for businesses. Another big hurdle people face on Facebook live video is that they don’t figure out what to talk about. It’s very simple: just think about what you sell, offer, or market. It’s not possible that you’re a graphics designer, and you can’t guide people about designing their business cards or can’t share tips and tricks for designing the logo. In other words, don’t ignore Facebook live and start by sharing what you know. 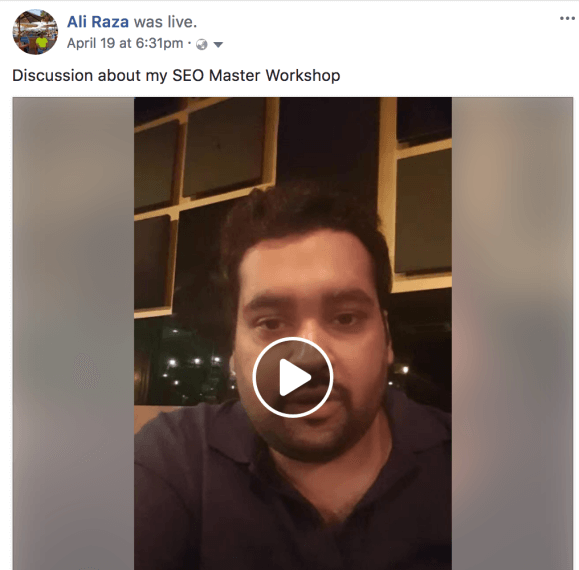 For example, recently i promoted my upcoming SEO Master Workshop and got a huge response. 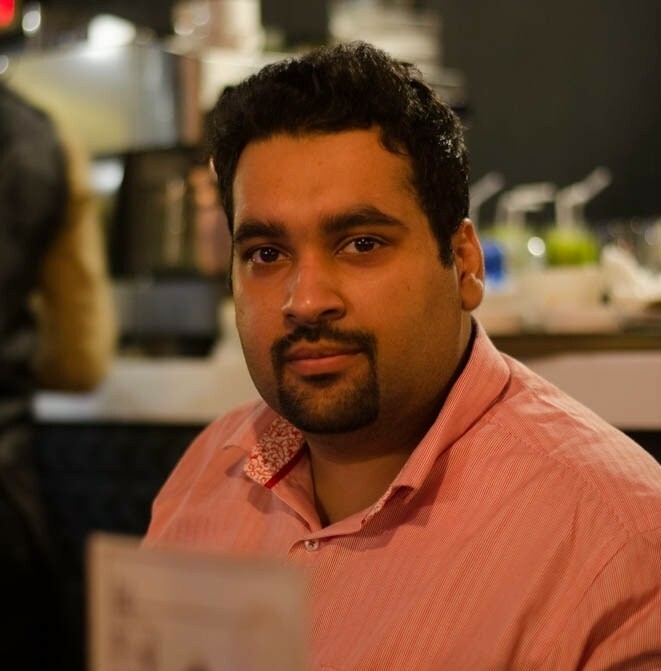 Host a Q&A session with your audience, which i frequently do myself. You can announce a new product. Discuss functions and features of a specific product. Good way to interview someone or be interviewed by someone. Pick an issue in your industry and start to have a discussion with it. You can teach people a specific skill you are master in, or answer queries of people related to it. Can interview someone or be interviewed by someone. 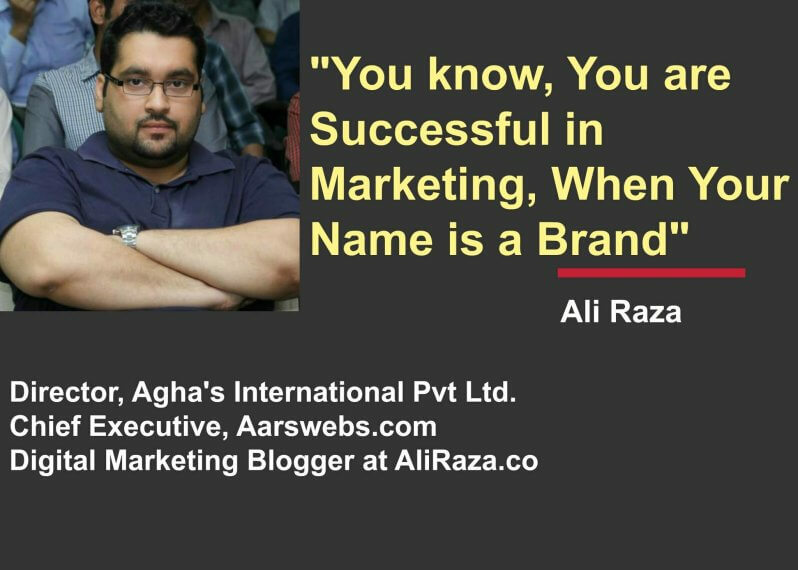 If you want to announce a new product, a good way is to come up live for a new product, software or course announcement, this will even help you in generating buzz for it. and if you like to be a broadcaster or a host, Can have a recurring show about any topic. If you are having a trouble in getting some equipment, you can use your existing camera or get a new best cheap vlogging camera and start doing live sessions on facebook with your new camera. According to research by Livestream and New York Magazine, 66% of respondents said they liked Facebook Live.So if you think Youtube is just all about going live, then you are wrong and missing the market. I’ve shared six strategies that won’t cost you any money to put your brand’s name out there. Yes, it would require you to offer value to the audience, but it shouldn’t be a problem because you might already be doing this. All you need is to be a little more strategic and consistent about marketing your business on Facebook. Which one of these Facebook method work for you? Your blog posts are absolutely amazing !!! Detailed and informative! A huge mistake I see people making with their pages is, they fall into the trap of sharing links to their websites/content all the time. With Facebook pages, I feel engagement is key. One great way of engaging people is asking them questions, trying to get conversations going. While there are a couple of great ways to achieve this, it is best done via videos – like you rightfully pointed out! A nice live video, with good content, will get people to engage. 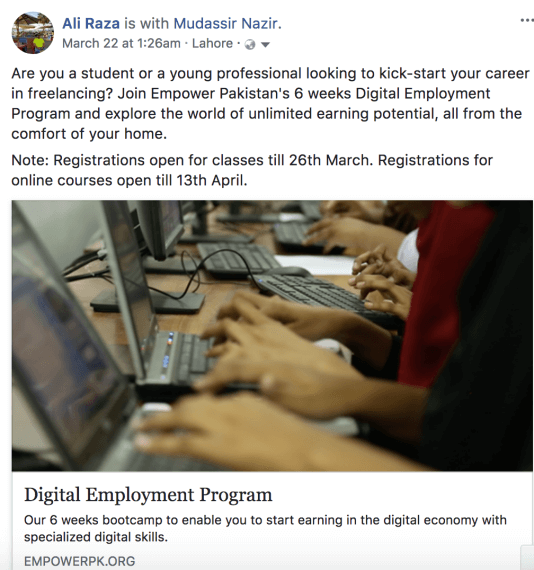 Once you have decent engagement, regular posts with links sprinkled in, are a super way to promote without spending money on FB ads. Thank you brother for summarizing it very well. 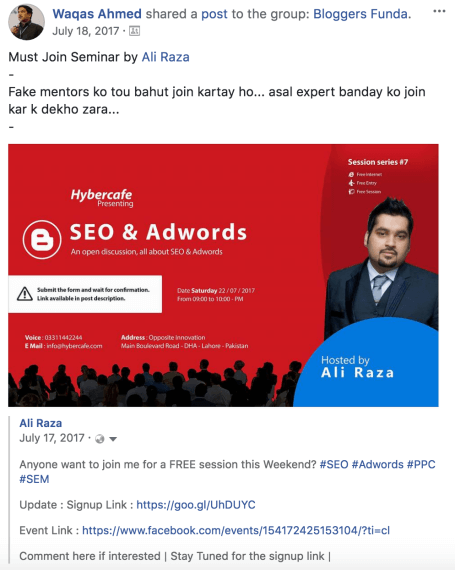 Yes You are right because the new facebook algo is also show those pages to users which are angaged properly handled and user are interact with the posts. Your writing is so wonderful. You’ve really captured the ideas very well. Your work always substantial, comprehensive and enlightening. Thank you! Yours welcome Azhar. Glad you find it useful! Thansk for sharing this post. I really like your blog because this blog always share informative and helpful posts. A very well researched and written article. It was a treat to read. Thanks ZunNurain for the appraisal, glad that you like it. I have followed the same way for business, But some of vital that you have told this guide was I missed. That simple mistake was the decrease my growth on social media. Im going retry everything on social media that you touched on here. A very helpful article for people with low marketing budget.